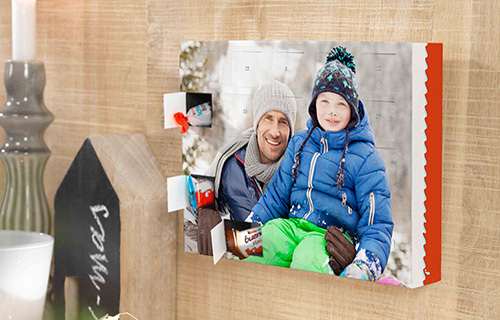 The unique and only photo Advent calendar for younger and older friends of delicious kinder® chocolate. 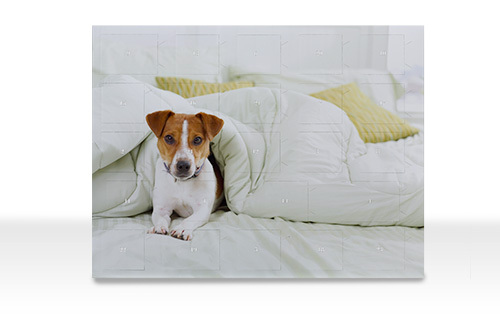 It embellishes the waiting time with your favourite photograph, professionally printed in super quality. Filled with the assorted kinder® chocolate, kinder Country®, kinder Bueno® and kinder Choco Bons®. A kinder a day, for each of the 24 days to Christmas! Milk chocolate 39% (sugar, whole milk powder, cocoa butter, cocoa mass, emulsifier: lecithins (soya, vanillin), sugar, skimmed milk powder, palm oil, concentrated butter, emulsifier: lecithins (soya), vanillin. Milk Chocolate 31% (sugar, cocoa butter, cocoa mass, skimmed milk powder, concentrated butter, emulsifier: lecithins (soya, vanillin) sugar, palm oil, wheat flour, hazelnuts (10.8%), skimmed milk powder, whole milk powder, chocolate (sugar, cocoa mass, cocoa butter, emulsifier: lecithins (soya), vanillin), low fat cocoa, emulsifier lecithins (soya), raising agents: sodium bicarbonate, ammonium bicarbonate, salt, vanillin. Milk Chocolate 37.5% (sugar, cocoa butter, whole milk powder, cocoa mass, emulsifier: lecithins (soya, vanillin), sugar, skimmed milk powder, palm oil, puffed cereals 6% (barley, rice, wheat, dinkel, buckwheat), concentrated butter, emulsifiers lecithin (soya), vanillin. Fine Milk Chocolate 50% (sugar, Whole milk powder, cocoa butter, cocoa mass, emulsifier: lecithins (soya, vanillin), sugar, skimmed milk powder, palm oil, hazelnuts (5.8%), concentrated butter, dark chocolate (sugar, cocoa mass, cocoa butter, emulsifier: lecithins (soya, vanillin), glazing agents (gum arabic, shellac), glucose syrup, emulsifier: lecithins (soya), flavoring, vanillin.